This course ranks #4 against all reviewed courses. Editor Note: A video has recently been published regarding Nial’s trades in the Axitrader competition. 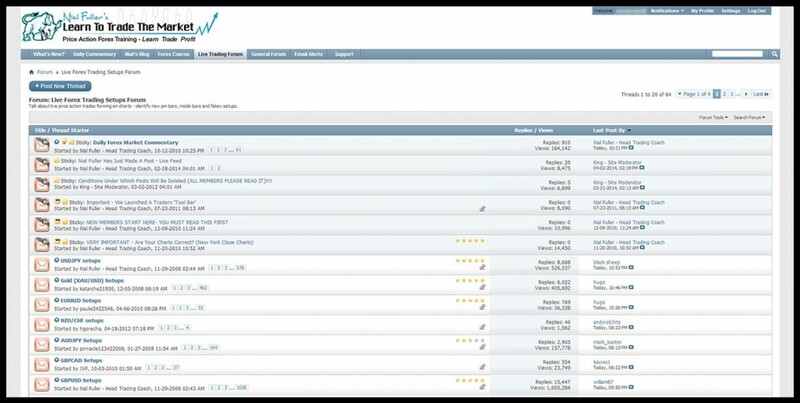 It must be noted the video was created by Chris Capre, who’s course we currently rank #1 on this site. Having said that, the video is worth watching for further perspective. The video can be found here. Learn To Trade the Market is run by Nial Fuller, and the paid course consists of four parts. The first part is all about the basics of forex trading. In this part, Nial explains almost all the necessary aspects pertaining to trading. This section is good for absolute beginners, but it’s also worth mentioning that a lot of this information is very similar to his free beginners course. The next three parts are mainly focused on trading strategies that are based on common price action patterns. There wasn’t much in-depth information, but still useful for beginners. In the latter parts of the course, Nial discusses various price action methods, trading plans, and pin bar reversal setups in detail with the help of diagrams, illustrations and charts. 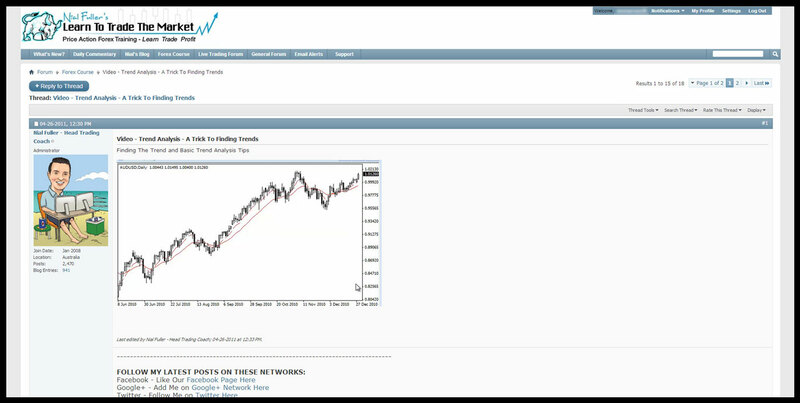 The paid members get access to a trade setups forum, along with Nial’s daily market commentary section. Nial Fuller, posts once a day in the daily commentary section of the forum, sharing his fundamental and technical analysis on various assets, and some trade ideas. We have to note some of these are from the ‘coach’ Larry K, so it’s hard to tell which information is from him and which is from Nial. As to the rest of the forum and lessons, Nial is not very active, but he will share a live trade once a month or so. He also infrequently posts new information or commentary for members. How Recent Are The Lessons? 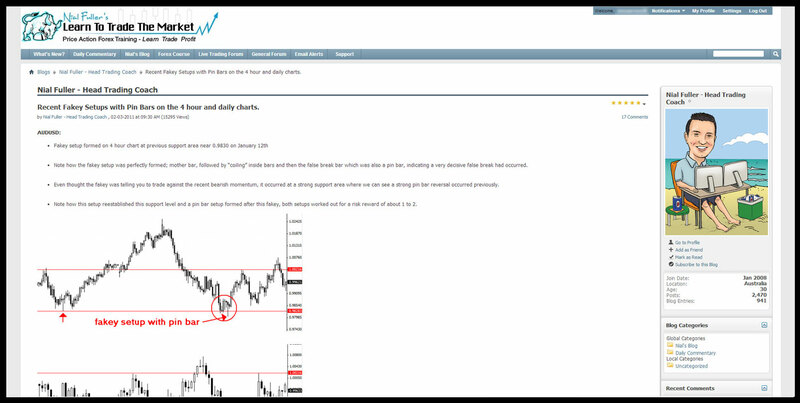 Nial’s forex course is about 2-3 years old; though the daily commentary sections are being updated regularly. The PDF course lessons (the main lessons) are dated from 2012. Daily Trade Setups Newsletter – he advertises commentary on at least 5 markets, but lately there has been less, sometimes only 3. Weekly Trade Setups Newsletter – he advertises commentary on at least 7 instruments, but often times there are less than 5. Quality & Value Of The Paid Content? The paid forex course and other parts of the forum have higher value as compared to the free educational content available on the site. The articles explain each topic with the help of solid graphical illustrations and charts. We could not find any quizzes to test member knowledge on the site. Following is a brief summary of various lessons included in this course. Introduction to Forex: Explains what the foreign exchange market is and how exactly forex trading works. History of Forex: Consists of an elaborate history of forex in two parts. Who Trades Forex? Explains the participants in the forex market. Advantages of Forex Trading: Highlights the numerous benefits associated with forex trading. The topic also covers some misconceptions pertaining to the forex market. Trading Sessions: Covers the timing of the forex market, break down of sessions, and easy illustrations of market hours with the help of a diagram. The Major Currency Pairs: An introduction to major currency pairs, their symbols, and difference between majors and crosses. Types of Trades: Explains the two types of trades in a language that’s easy to understand. Margin & Leverage: Introduction to margin & leverage, and tips on how to select a suitable leverage. Spreads & Pips: Introducing spreads and pips with the help of a diagram and examples. Types of Contracts: Explains the types of lots or contracts along with the pip value of each contract. Types of Traders: Explains the styles of trading in detail along with the pros and cons of each style. Order Types & Terms: Explains the types of orders and various technical terms used in this regard. It is an in-depth topic which explains various order types with the help of diagrams and examples. Risk Control: Explains the significance of stop loss, calculation of risk per trade, and tips on how to place the stop loss. What Moves the Forex Price: Highlights various fundamental factors responsible for moving the price of an asset. This is a detailed chapter explaining each of the factors with the help of examples. Earning or Paying Interest: Explains different concepts pertaining to interest earnings and charges such as roll-over, and carry cost. Major Economic Releases: Explains various economic releases such as trade balance, GDP, consumer price index, producer price index, payroll employment, durable goods orders, retail sales, and housing starts. Money Management: This is perhaps the most important chapter which explains the significance of proper risk/reward ratio. It also illustrates the money management strategies with the help of charts, diagrams and tables. Technical Analysis: This section is all about technical analysis, charts, price action, support & resistance, swing levels and the candlestick pattern. Trend Analysis & Laws of the Market: The topic covers the importance of the trend, methods to identify the trend, and how the actual market works. Mean Reversion: Explains the concept of pivot point with the help of examples and charts. Moving Averages: Shows the identification of trends and key areas through moving averages. Nial explained the use of 150 and 365 EMAs as well as 8 and 21 EMAs in detail with the help of charts and examples. Candlestick Pattern: Explains the practical use of candlestick pattern in daily trading. Nial taught the use of pin bars and other reversal candles with the help of nice examples and graphic illustrations. It also covers the significance of reversal candles around key levels, inside bar trade setups, flaky setups, and placement of stop in real trading. Trendlines: It is all about trendlines, their significance and practical use in daily trading. Money Management: The chapter explains the use of proper risk/reward ratio and position sizing in great detail with the help of examples and illustrations. It also has some very good tips pertaining to money management. Market Psychology: It consists of about 14 guidelines on how to understand the psychology of the market and how to control emotions. Some good tips for intraday trading are also given at the end of the chapter. Some Major Candlestick Patterns: The topic consists of graphical illustrations pertaining to pin bars, inside bars, flaky trade setups, and combo pin bars. Entering the Setups: In this topic, Nial explained how to enter the market after the emergence of some key reversal pattern, he shared some decent guidelines to trade the pin bar reversals, inside bars, long tail pin bars, fakey’s, inside-pin bar combo, and fakey-pin bar combo etc. There was no theory or discussion of order flow, instead, there were more charts and graphical illustrations. Confluence Levels: Discussion of the confluence levels in relation to the trend. Four-Hour Timeframe: In this topic, Nial explains how to trade pin bars in a four-hour timeframe. He shows examples of how to trade four-hour pin bars. Trend Is Your Friend: Explains why it so important to identify the right trend and trade accordingly. The blog consists of educational articles, case studies and guidelines for the paid members. At the moment, there are around 30 posts in the blog. What we found interesting is how Nial mentions ‘Why He Hates Intra-Day Trading’, yet has a blog post on how to trade intra-day. We wonder why there is a contradiction here. There was also a mention to provide paid members Forex lessons approximately every 2 weeks, though on average, there is approximately one article per year. As a whole, Nial Fuller is not very active in providing new material or content, but at least from the articles he does provide, they are pretty decent and useful. The live trading forum mainly consists of the latest trade setups by the moderators. Nial shares his own trade setups once a month, and he admits he only trades 2-3 times per month. We are not sure if this makes him more of an investor rather than a trader. Paid members may find trade setups of major currency pairs, commodity futures and stock market indices. This is the section where premium members may find daily commentary about major currencies and commodities. The commentary is posted by Nial and his coach Larry K. The articles in this part of the forum consist of latest technical analysis and trade ideas. Based on the above, we feel to rate the course as a 6 out of 10. We feel the course could give you a decent start in learning about price action, but it will not take you to an advanced level.